Health mix powder/ Sathu Maavu/ homemade Cerelac powdert for babies is made of more healthy ingredients and suggested as a best nutrient rich food for babies. But many mothers are worried that their babies don’t prefer this sathu maavu porridge or homemade Cerelac porridge made with health mix powder when they grow. 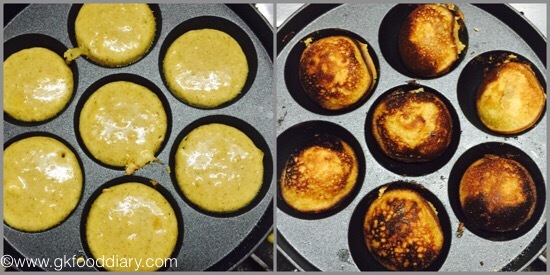 It was my sisters idea to try making dumplings or paniyaram & dosa with health mix powder and should say I absolutely loved it. I am sure that babies will like it too as my little daughter had it and kept asking for more. 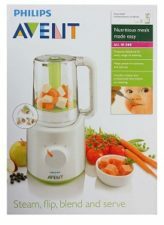 I am really happy that I have found a way to include the health mix powder in babies diet, yes it’s sure a winner for me!!! 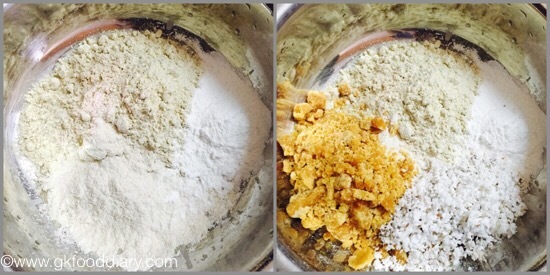 You can either make paniyaram/ dumplings with this health mix powder. Both are tastes equally good. But If I given a choice, then I will surely opt for paniyaram or dumplings as it’s more healthy. 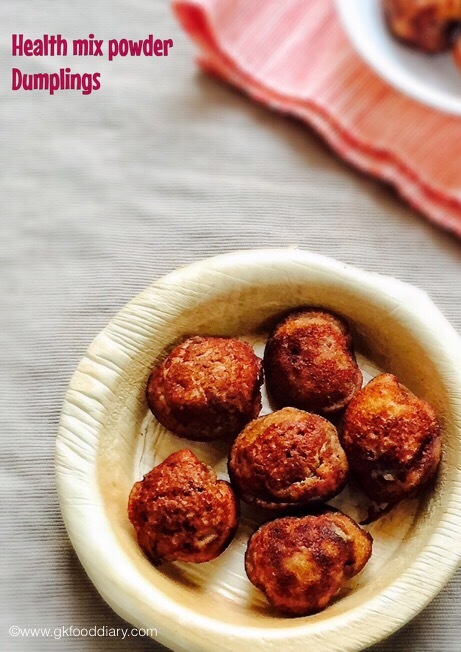 If you don’t own a paniyaram pan to make dumplings, you could opt for dosa. This divine smelling dumplings or dosa can be given to babies from 10 months as a delicious snack. 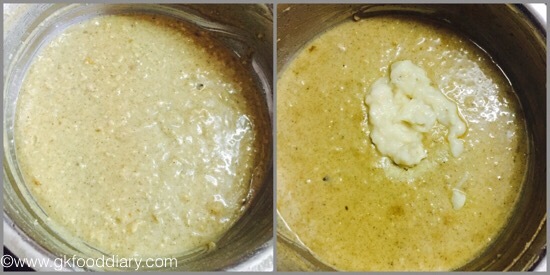 Let’s check how to make this healthy dumplings & dosa with health mix powder with jaggery for babies & kids. 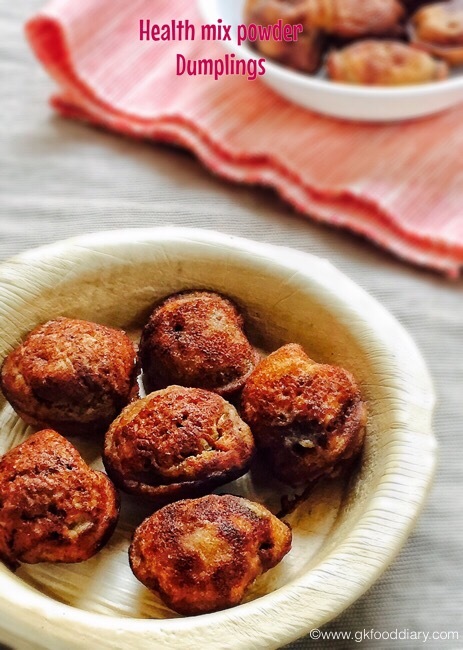 Health mix powder dumplings - dumplings recipe with health mix powder or homemade Cerelac & Jaggery. Easy and healthy snack for babies & kids. Measure health mix powder, rice flour wheat flour & Jaggery. Keep it ready. In a vessel, add wheat flour, jaggery, scrapped coconut, powdered cardamom and salt. Add water little by little and mix well so that no lumps are formed. The batter should be slightly thick. So adjust water accordingly.Set aside for 3 hours. After 3 hours, mix again and add mashed banana & cooking soda(if using). 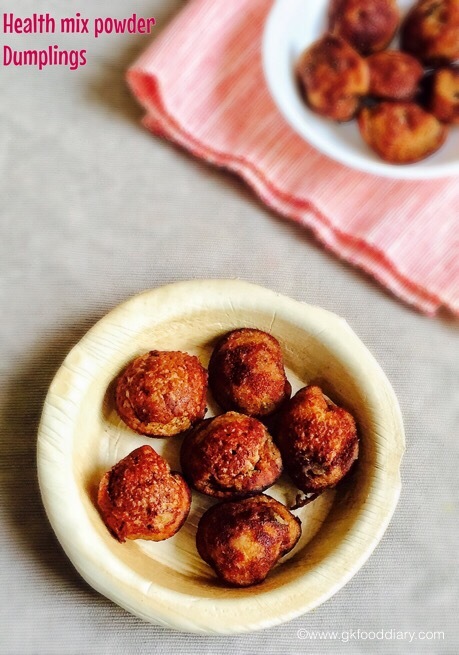 Heat a paniyaram pan, add ¼ tsp of ghee in each swallow, and pour this batter. Cook covered in low flame for 3 minutes and carefully flip to the other side using a spoon. Cook it further for 2 minutes or until it turns golden brown. Add more ghee if required. 1. Measure health mix powder, rice flour wheat flour & Jaggery. Keep it ready. In a vessel, add wheat flour, jaggery, scrapped coconut, powdered cardamom and salt. 2. Add water little by little and mix well so that no lumps are formed. The batter should be slightly thick. So adjust water accordingly.Set aside for 3 hours. After 3 hours, mix again and add mashed banana & cooking soda(if using). 3. Heat a paniyaram pan, add 1/4 tsp of ghee in each swallow, and pour this batter. Cook covered in low flame for 3 minutes and carefully flip to the other side using a spoon. Cook it further for 2 minutes or until it turns golden brown. Add more ghee if required. 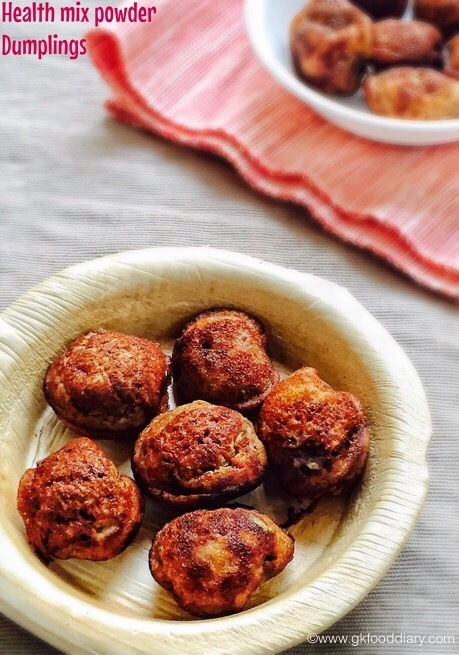 The super healthy and tasty health mix powder dumplings is ready ! 1. Heat a dosa tawa, add a ladle of batter to it and spread it to form a circle. Don’t spread too much. Sprinkle ghee or oil. 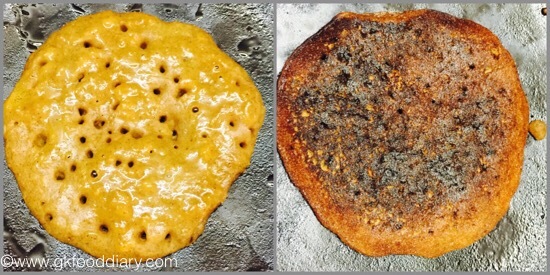 Cook until brown on one side for five minutes and flip the dosa. Cook for a minute and remove from tawa. Repeat the same process for the remaining batter. The super healthy and tasty health mix powder dosa is ready ! !